Somehow, I always ended up playing the same way: my clan winds up as a fairly peaceful and prosperous bunch of Ernalda (earth mother) worshippers. When I try to be all warlike and propitiate Humakt (death god) and bully my neighbors, I never really get anywhere. Even still, there’s always so many things to take care of and new situations that it never gets old to me. Plus, I love the art: the game itself is text-based, but each event has a beautifully drawn image to go with it. (You can buy some of the original art, although I think all things considered, I’d rather not be hanging that particular chaos monstrosity on my walls.) If you like simulation or strategy games at all, I really recommend it – it’s got a steep learning curve, but with patience, it’s a very rewarding game. King of Dragon Pass has been on my mind because, more than a decade after it was released, the developers are working on versions for the iPhone, iPod Touch and possibly the iPad! Now, I own none of these devices, but I’m excited anyways, because I love this game and I’d be really happy to see it get popular on those platforms. Sadly, I haven’t played King of Dragon Pass for many years now, since I haven’t been able to find the CD even though I’ve looked everywhere for it. I think the last time I saw it was three or four apartments ago, and every so often I will have an overwhelming desire to manage cattle and I’ll look for it… I can’t imagine that we got rid of it, even accidentally, but we don’t really have too much stuff… I dropped some hints (on the order of “Hey, you should get this for me, OK?”) to Brian that I wanted the Mac version for Christmas, so he ordered it for me, but hasn’t heard back from anyone yet. I hope I get it soon! 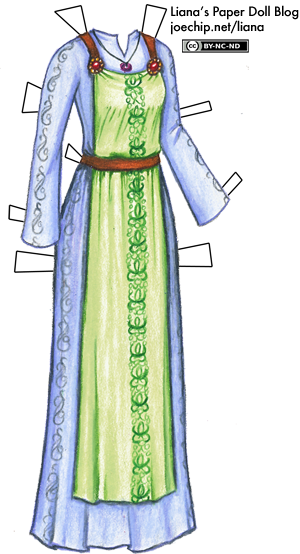 The women generally wear long dresses with a different-colored tunic, belted at the waist, although there’s a fairly good selection of outfits, since women can take on a lot of jobs including trading, hunting and fighting. This is just a generic outfit that’s not really based on anything in particular. Dear Liana, I am the editor of a magazine by the name of OFD (Old Fashioned Daughters). I was wondering if you would be at all interested in designing a Christmas paper doll. Preferably mid 1700’s and on one sheet of paper. If you think this might be possible I would need it by the 5th of December. this is really pretty! I like it cause It’s set in medieval times. well done, Liana! I love the colors on this dress and with the embroidery/designs on it, it really has a celtic feel. I was curious if we were going to get the Good Queen dress redo…? It’s plain, yes, but the sleeves’ designs are just lovely. It’s nice and generic so it could be used for many purposes, I’m sure. I love this dress. And the little ancedote was so cute!! Your designs are much more detailed than some others, and more of a variety. Like your 1800’s dress and now one based off a video game! Your the best! One more after thought, I love the little added necklace. I love it! Again you impress me!!! Its beautiful. Well done. I love your “Reader, I married him” comment as I just finished reading Jane Eyre again and have been watching the movies. This is so pretty. My Birthday is the twenty fifth of November, which was Thanksgiving! it was awesome to see it.